Bo tree is known as Buddha attained spiritual enlightenment under the tree. Most of local temples here in Thailand have Bo trees planted in the temple. 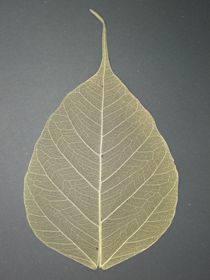 The Bo Tree Leaves have 6-8 pairs of side-veins and a further network of very fine veins. 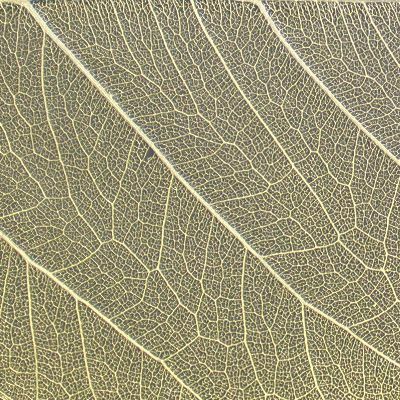 This delicate venation and the ability of the leaf to disintegrate in water gives good benefit to create rich appearance of skeleton leaves which will be utilized as a attractive decoration of handicraft goods. 25 leaves are packed in a plastic bag. The price shown below is for 25 leaves. We have size range of approximate 2", 3", 4" and 5" (height of the leaf) for your choice. Please take a look of enlarged image by clicking the button of "Click image for a closer look" or click the image to see more detail of this fine product. Please click check box of your chosen size and enter quantity in the entry box. You can choose as many as what you want and finally click "Add To Cart" button. Wholesale Customers: For information on bulk order discounts, credit accounts and our special services for paper wholesalers and distributors, please read our wholesalers and distributors information page. Get News, What's New and Special Offers! Order Your Free Samples Here! Get Our Price List Now! Want to become an HQ Wholesaler? HQ PaperMaker™ is a trademark of HQ Group Company Limited. © Copyright 2004 HQ Group Co. Ltd. All rights reserved.